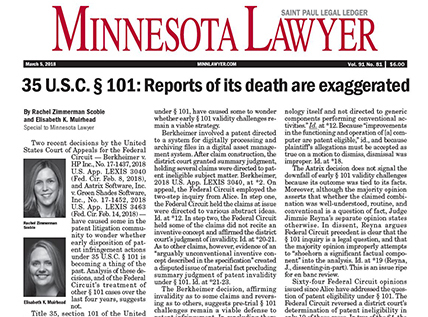 Merchant & Gould attorneys Rachel Zimmerman Scobie and Elisabeth Muirhead co-authored a Minnesota Lawyer article titled "35 U.S.C. § 101: Reports of its death are exaggerated." The article examines two recent decisions by the U.S. Court of Appeals for the Federal Circuit which have caused some in the patent litigation commu­nity to wonder whether early disposition of pat­ent infringement actions under 35 U.S.C. § 101 is becoming a thing of the past. Analysis of these de­cisions, and of the Federal Circuit’s treatment of other § 101 cases over the last four years, suggests not. Minnesota Lawyer published this article on March 5, 2018 in both the print and digital editions. Two recent decisions by the United States Court of Appeals for the Federal Circuit — Berkheimer v. HP Inc., No. 17-1437, 2018 U.S. App. LEXIS 3040 (Fed. Cir. Feb. 8, 2018), and Aatrix Software, Inc. v. Green Shades Software, Inc., No. 17-1452, 2018 U.S. App. LEXIS 3463 (Fed. Cir. Feb. 14, 2018) — have caused some in the patent litigation community to wonder whether early disposition of patent infringement actions under 35 U.S.C. § 101 is becoming a thing of the past. Analysis of these decisions, and of the Federal Circuit’s treatment of other § 101 cases over the last four years, suggests not. Title 35, section 101 of the United States Code defines patent eligible subject matter. As interpreted by the Supreme Court, laws of nature, natural phenomena, or abstract ideas are not patent eligible. In Alice Corp. v. CLS Bank, Int’l, 134 S. Ct. 2347 (2014), the Supreme Court explained that all decisions of patent eligibility should be made using a two-step inquiry, asking (1) whether the patent claim at issue covers an abstract idea and, if so, (2) whether the patent adds something extra that embodies an inventive concept. An affirmative answer to the second question requires that the claimed invention involve more than the performance of “well-understood, routine, conventional activit[ies]’ previously known to the industry.” Alice, 134 S. Ct. at 2359. Patent eligibility under § 101 is a question of law. In the years since Alice, federal courts have regularly employed its two-step inquiry to invalidate patent claims at all stages of litigation, including on early motions to dismiss or for judgment on the pleadings. Many of these challenges succeeded. The Federal Circuit’s recent decisions in Berkheimer and Aatrix, reversing district court judgments of invalidity under § 101, have caused some to wonder whether early § 101 validity challenges remain a viable strategy. Berkheimer involved a patent directed to a system for digitally processing and archiving files in a digital asset management system. After claim construction, the district court granted summary judgment, holding several claims were directed to patent ineligible subject matter. Berkheimer, 2018 U.S. App. LEXIS 3040, at *2. On appeal, the Federal Circuit employed the two-step inquiry from Alice. In step one, the Federal Circuit held the claims at issue were directed to various abstract ideas. Id. at *12. In step two, the Federal Circuit held some of the claims did not recite an inventive concept and affirmed the district court’s judgment of invalidity. Id. at *20-21. As to other claims, however, evidence of an “arguably unconventional inventive concept described in the specification” created a disputed issue of material fact precluding summary judgment of patent invalidity under § 101. Id. at *21-23. The Berkheimer decision, affirming invalidity as to some claims and reversing as to others, suggests pre-trial § 101 challenges remain a viable defense to patent infringement. In concluding there remained an issue for trial on the § 101 defense as to some of the claims, the Federal Circuit relied heavily on statements in the patent’s specification asserting elements of those claims were not known. Id. at *19. In attempting to reconcile this decision with prior decisions reaching a contrary result, the presence or absence of such statements stands out as a critical distinction. Compare Berkheimer, 2018 U.S. App. LEXIS 3040 with Inventor Holdings, LLC v. Bed Bath & Beyond, Inc., 876 F.3d 1372, 1378 (Fed. Cir. 2017) (“[T]he only components disclosed in the specification for implementing the asserted method claims are unambiguously described as ‘conventional.’”). Aatrix involved patents directed to designing, creating, and importing data into a viewable form on a computer. The district court held the claims covered patent ineligible subject matter, and dismissed the action. Aatrix, 2018 U.S. App. LEXIS 3463, at *4. On appeal, the Federal Circuit reversed. The plaintiff in Aatrix presented numerous allegations to support its assertion that the claims at issue were directed to “an improvement in the computer technology itself and not directed to generic components performing conventional activities.” Id. at *12. Because “improvements in the functioning and operation of [a] computer are patent eligible,” id., and because plaintiff’s allegations must be accepted as true on a motion to dismiss, dismissal was improper. Id. at *18. The Aatrix decision does not signal the downfall of early § 101 validity challenges because its outcome was tied to its facts. Moreover, although the majority opinion asserts that whether the claimed combination was well-understood, routine, and conventional is a question of fact, Judge Jimmie Reyna’s separate opinion states otherwise. In dissent, Reyna argues Federal Circuit precedent is clear that the § 101 inquiry is a legal question, and that the majority opinion improperly attempts to “shoehorn a significant factual component” into the analysis. Id. at *19 (Reyna, J., dissenting-in-part). This is an issue ripe for en banc review. Sixty-four Federal Circuit opinions issued since Alice have addressed the question of patent eligibility under § 101. The Federal Circuit reversed a district court’s determination of patent ineligibility in only 10 of those cases. In two of the 64, the Federal Circuit determined patent claims were invalid under § 101 even though the district court had held otherwise. And just two days after its decision in Aatrix, the Federal Circuit affirmed a district court’s grant of judgment on the pleadings that the asserted patent claims were invalid under § 101. Automated Tracking Sols., LLC v. Coca-Cola Co., No. 17-1494, 2018 U.S. App. LEXIS 3779 (Fed. Cir. Feb. 16, 2018). In spite of Berkheimer and Aatrix, the odds on a § 101 invalidity challenge remain favorable for accused infringers.